NEW WILEY’S FINEST WILD ALASKAN FISH OIL’S!! 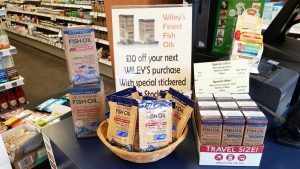 Buy an orange or lemon flavoured travel sized fish oil (60ml), then get £10 off selected labelled Wiley’s Finest fish oil’s on your next purchase. Just bring the travel size box with you the next time you purchase to show the label. OFFER VALID UNTIL 31-08-19!